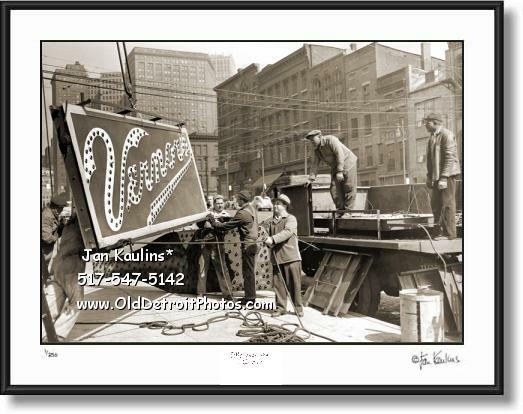 OLD VERNORS GINGER ALE 1946 SIGN removal photo picture print photographs for sale. This is the original Vernors sign on Woodward Avenue photo picture print photograph for sale. This sepia toned black and white OLD VERNORS GINGER ALE sign removal photo picture print FOR SALE is made from the professionally restored very rare original 1946 black and white Vernors Ginger Ale sign photo/negative. This is the ORIGINAL VERNOR'S GINGER ALE sign that was a landmark for many years located at the foot of Woodward Avenue in downtown Detroit, Michigan. It was the very FIRST animated electric sign in Detroit and became an icon for the millions of Vernor's Ginger Ale lovers in Detroit. This rare photo shows this historic Vernor's sign being removed from the building where it had been since around 1915. It was removed because of the new City of Detroit ordinance prohibiting signs hanging over a sidewalk and was taken (unbelievable with no thought of historic significance) to the local scrapyard where it was crushed for scrap! The fabulous photo captured this historic moment on April 10, 1946 as the Vernor's sign was lowered to the sidewalk about to be loaded on the truck to take it to its final destination.